“Cooperative” play in the recent string of New Super Mario Bros. games hasn’t necessarily been a mode where players work together to achieve goals. Especially among my friends, gaming together in New Super Mario Bros. tends to equate to one poor sap repeatedly getting thrown or bumped into bottomless pits. Cooperative becomes angry and competitive in a heartbeat. The trailer at the head of this post shows off a whole slew of moments from New Super Mario Bros. U‘s cooperative gameplay. Clearly, the footage is fake. Not once did I see someone hurl a friend into a pool of lava. As far as Mario platformers go, New Super Mario Bros. U is looking great. Sure, it won’t do anything to flip the genre on its head, but this game looks to combine fine mechanics, a system that works and a spiritual succession to Super Mario World under one umbrella. I’ll be getting it, and I’ll wager that it’s one of the highest selling games for the Wii U for a good, long time. 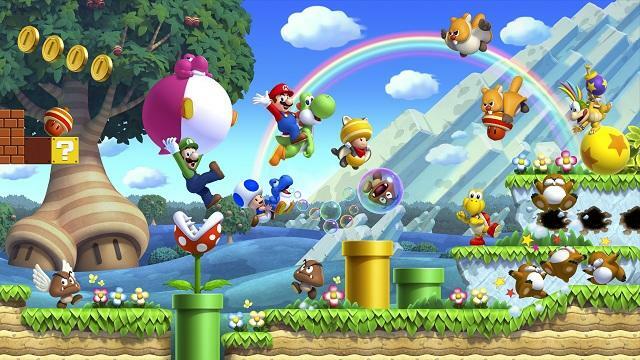 New Super Mario Bros. U will launch with Nintendo’s upcoming Wii U on November 18th of this year. Will you be buying this console?